Mike Dormer leaves London for Australia to secure a location for his company's next big hotel development. Silver Bay is the perfect place to build the high-end resort, since the only other accommodation in the area is the old ramshackle Silver Bay Hotel. But after spending a little time at this quiet hotel, getting to know the natives and learning about the wildlife in the area, Mike begins to wonder if this really is the best place for the larger-than-life resort. He also begins to question if the life he's living in London is really what he wants. Silver Bay by Jojo Moyes is a character-driven story that drops Mike right into the lives of the hotel's owner, Kathleen, her niece Liza and Liza's daughter, who all live in the hotel. The others who live in the area and run the dolphin and whale watching boats add to the intriguing cast of characters. All of their lives are entwined with the bay and they are all passionate about protecting the whales as they migrate past their home twice a year. When I picked up this book, I was in need of an easy read that would pull me into another world and keep me absorbed in the story. This was the perfect choice. I enjoyed watching the transformation of several of the characters throughout the story. I was anxious to see whether Mike would do what was right for his business or for the people of Silver Bay. And Liza's background and reasons for wanting to protect her daughter from everything was a mystery until the end. If you're looking for a novel that gets into the heart of the characters ~ and brings in a bit of environmental activism as well ~ I highly recommend Silver Bay. 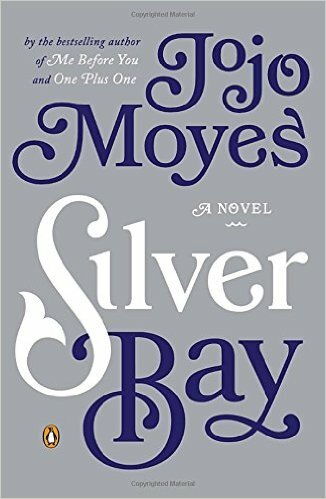 This review was written based on a copy of Silver Bay that I borrowed from the library. This post includes Amazon Affiliate links. If you purchase something using my link, I will receive a very small commission but your price does not change. This sounds good! I still haven;t read a Moyes novel yet - she is high on my TBR list! I would really like to read Me Before You before the movie comes out. You should definitely try to read that one! It's a quick read and you'll definitely want to read the book before the movie.